Enquiries. Get in Touch with any Questions. We're here to help! Enquiries. If you have any questions about our hotel or restaurant, please don’t hesitate to get in touch! You can make your reservation enquiry for the hotel, restaurant, beauty salon or sunbeds here, or follow the direct links to those pages. Thank you for considering El Oceano! We hope to see you soon! If you have any enquiries or question regarding bookings or reservations in the hotel, the restaurant or the beauty centre, please let us know. We’re here to help! We will generally respond with 24 hours (usually much sooner), but if you enquiry is urgent, you may be better calling our Reception Desk on (0034) 952 587 550. If you are ready to book your room, you can do so directly by clicking here. Ask First. If you have any Questions Regarding your Stay, Get in Touch. Alternatively, if you have any question regarding accommodation at El Oceano, please get in touch here. If your enquiry relates to our restaurant or beauty centre, click the relevant tab! Thank you in advance for your enquiry! 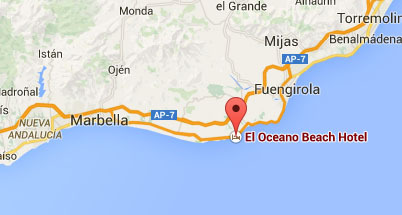 Find El Oceano on Mijas Costa, between La Cala de Mijas and Marbella. Make your restaurant reservation enquiry here and we will get back to you as soon as possible. Please note, this is not a confirmed restaurant booking. We will confirm your booking personally, either by reply email or telephone. If your enquiry is for tonight or tomorrow, you may be better confirming availability by telephone, call (+34) 952 587 550. Please make your booking enquiry here, for treatments at the Beauty Salon. Please note, this form does not constitute a confirmed booking. We will contact you either by email or telephone to confirm your treatment reservation. If you need to make an appointment for today or tomorrow, you may be better calling us directly on (+34) 952 49 20 37. El Oceano really is the perfect wedding venue for the perfect beach wedding. Always a very popular venue, we will make your special day perfect. Let us know about yourself and we’ll get back to you as soon as we can! VIP Sun Bed bookings are not currently being taken via the website.